Online filing of GSTR 9 has been made active on the GST portal. It can be accessed after logging in the portal and selecting Services -> Returns -> Annual Return. 1. There is no facility for revision of GSTR 9. Therefore, it is advised to file GSTR 9 with utmost care. 2. Online filing tool is available in cases where the number of records in Table 17 (HSN wise summary of outward supplies) or Table 18 (HSN wise summary of inward supplies) are upto 500. 3. Where number of records exceed 500 in Table 17 or 18, then filing will be facilitated through offline utility only. Offline utility is not available for download as of now, but it is expected to be activated very soon. 4. A summary of GSTR 9 is available on the portal for downloading which is based on the GSTR 1 and 3B already filed by the registered person. 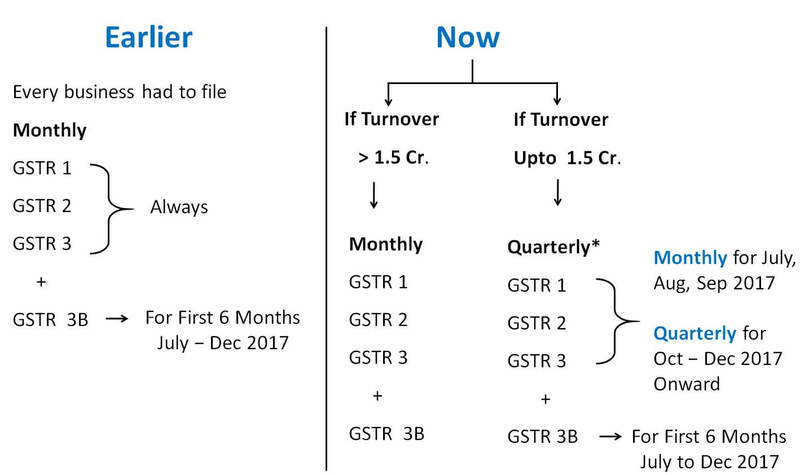 Such summary is only for representational purpose and the facility to make changes in the fields reflected in the GSTR 9 is available through the online filing tool. 5. Summarized GSTR 1 and 3B for FY 17-18 are also available for downloading. 6. After filling up the details in the respective tables, the registered taxpayer shall click on "Compute liability" button to ascertain the amount of liability. If there is any short payment, then payment of tax can be made through GST DRC-03. Such liability can be paid only in cash. Composition dealers in goods allowed to supply services for a value not exceeding – Higher of 10% turnover or Rs 5 lacs, whichever is higher. Taxpayers may opt for multiple registrations within a state/UT for different place of business having same PAN. Registration shall remain temporary suspended till completion of cancellation (No return to be filled). Threshold limit of turnover for exemption for special category states – Assam, Arunachal Pradesh, Himachal Pradesh, Meghalaya, Sikkim, Uttarakhand increased to Rs 20, 00,000. Registered person may issue consolidated credit or debit notes to a party in respect of multiple invoices issued in a financial year to that party. Key updates of 31st GST Council Meeting. GST Rates of 7 items reduced from 28% to 18% . Items include tyres, VCR, billiards & snookers and lithium batteries. MSME Committee may re-consider the thresh hold limit of 20 Lakh for larger interest. Centralized authority for Advance ruling in case of conflicting views of Advance Ruling Authorities. The decision of Centralized authority will bind the whole country. to use old Good and Services Identification No. of such months, on or before the 31st day of May, 2018. In case of Reverse Charge,if payment made in advance,still reverse charge is applicable for both gods and services. Reverse Charge on purchases From Unregistered Dealer has been abolished till 31 March 2018. 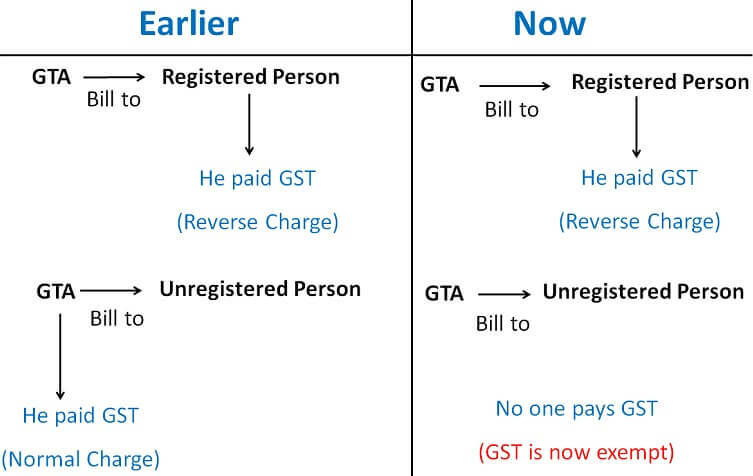 Because of this GTA were not willing to supply services to Unregistered persons. This service has been exempted. GST Council also approved levy of cess on intra State supply of goods and services within the State of Kerala at a rate not exceeding 1% for a period not exceeding 2 years. The limit of annual turnover in the preceding financial year for availing composition scheme for goods shall be increased to Rs 1.5 crore. 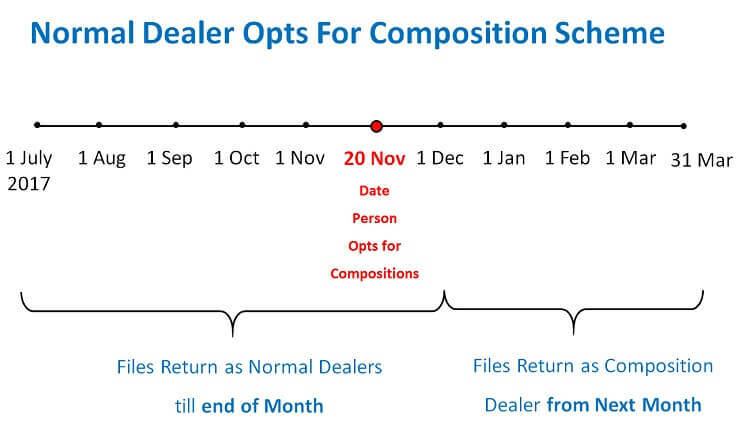 Special category States would decide, within one week, about the composition limit in their respective States. A composition scheme shall be made available for suppliers of services (or mixed suppliers) with a tax rate of 6% (3% CGST + 3% SGST) having an annual turnover in preceding financial year upto Rs 50 lakhs. The said scheme shall also be applicable to both service providers as well as suppliers of goods and services, who are not eligible for the presently available composition scheme for goods. i) Proposal of giving a composition scheme to boost the residential segment of the real estate sector. 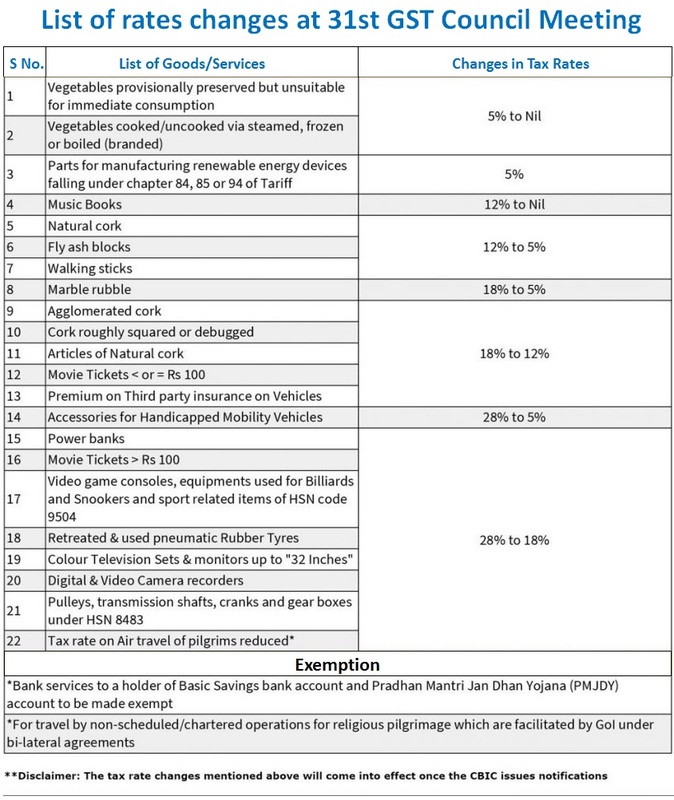 ii) GST rate structure on lotteries. 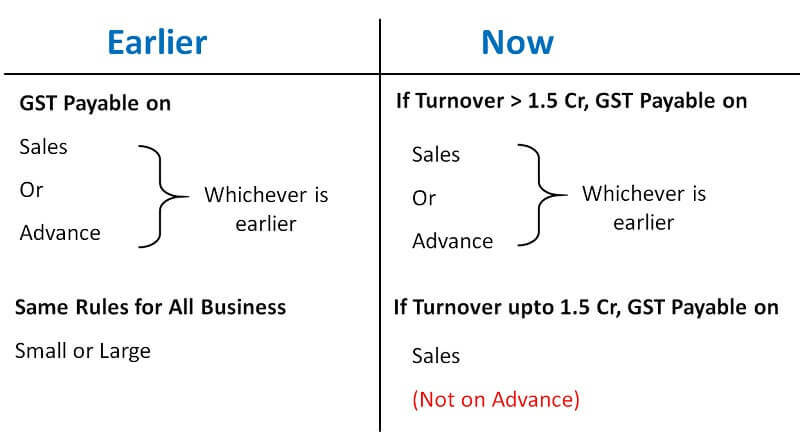 Changes made by CGST (Amendment) Act,2018, IGST (Amendment) Act, 2018, UTGST (Amendment) Act, 2018 and GST (Compensation to States) Amendment Act, 2018 along with amendments in CGST Rules, notifications and Circulars issued earlier and the corresponding changes in SGST Acts would be notified w.e.f. 01.02.2019.